Netflix shares were downgraded by Deutsche Bank from “buy” to “hold’ on Tuesday, following the streaming company’s huge second quarter subscriber miss on Monday. Netflix stock is down nearly 13 percent in premarket at $349 per share. The company’s stock had risen more than 108 percent this year, at $400.48 per share at the close of trading Monday. Netflix missed its quarterly subscriber addition projections by a staggering 1 million subscribers. The company had pegged that quarterly number at 6.2 million but only reported 5.15 million subscribers, overturning its own reputation for beating estimates. Deutsche Bank lowered its price target on the company’s shares to $350, from $360. 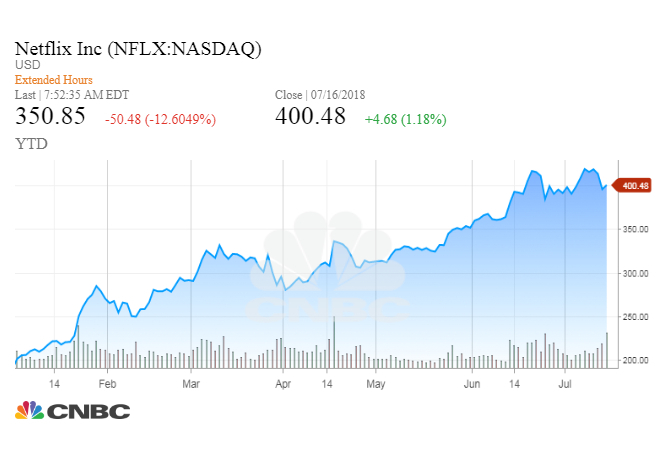 “Despite continuing to like the story, we just don’t see much upside over the next 12 months at this valuation level,” the firm said, before adding that it still thinks Netflix “stock can double by 2025, to $700” per share. Some on Wall Street worried before the earnings that the company could not sustain this year’s breakneck pace of share growth. Deutsche Bank noted the plunge in Netflix shares on Monday evening but stopped short of joining those cautioning against the future of the stock. “While the sell-off in after market trading post earnings was significant, it is worth noting that the stock is only back to where it was in late May,” Deutsche Bank added.